Mraz is of Czech descent through his grandfather who moved to the United States from what is now the Czech Republic in 1915. His surname is Czech for "frost." He attended The American Musical and Dramatic Academy in New York City, for a short time, studying musical theater before moving to San Diego. In 2002, Mraz released his first major album, Waiting for My Rocket to Come. In July 2005, Mraz opened for Alanis Morissette during her Jagged Little Pill Acoustic Tour. On July 26, 2005, he released his second major-label album, Mr. A-Z, for Atlantic Records. It entered the Billboard 200 album chart at number 5. In December, the album earned a Grammy Award nomination for Best Engineered Album, Non-Classical, while its producer, the prolific Steve Lillywhite, received a nomination for Producer of the Year. His first single, "The Remedy (I Won't Worry)," was co-written by music production team The Matrix. Mraz's friend and former roommate Billy "Bushwalla" Galewood also collaborated on the album, co-writing "Curbside Prophet" and the album's third single, and "I'll Do Anything". Mraz began his long-running tour in support of Mr. A-Z at the San Diego Music Awards on September 12. The tour featured a variety of opening acts, including Bushwalla and Tristan Prettyman, with whom he had co-written the duet "Shy That Way" in 2002. Mraz and Prettyman dated, ending their relationship in 2006. They also co-wrote the song "All I Want For Christmas is Us". In November 2005, Mraz opened for the Rolling Stones on five dates during their 2005–2006 world tour. Also in 2005, Mraz was one of many singers featured in the fall advertisement campaign for The Gap entitled "Favorites". The music-themed campaign also featured other singers including Tristan Prettyman, Michelle Branch, Joss Stone, Keith Urban, Alanis Morissette, Brandon Boyd, and Michelle Williams. In December 2005, Mraz released the first part of his ongoing podcast. In March 2006, Mraz also performed for the first time at a sold-out performance in Singapore with Toca Rivera as part of the annual Mosaic Music Festival. In May 2006, Mraz toured mostly small venues and music festivals in the U.S., along with a few shows in the United Kingdom and Ireland. The tour included a May 6, 2006 acoustic show with P.O.D., Better Than Ezra, Live, and The Presidents of the United States of America. Mraz was featured as a headlining guest of St. Louis's annual Fair St. Louis and performed a free concert at the base of the Arch on July 1, 2006. In December 2006, Selections for Friends, the live, online-only album recorded during the Songs for Friends Tour, was released. Selections for Friends features Jason's favorite songs from the Schubas Tavern and Villa Montalvo shows he played in July 2006. 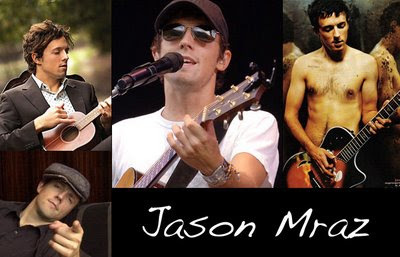 Jason Mraz began 2007 by debuting his new single "The Beauty in Ugly", an earlier track penned by Mraz entitled "Plain Jane" that he rewrote for the ABC TV show Ugly Betty. The song was featured as a part of ABC's "Be Ugly in '07" campaign. He has since released a song in Spanish entitled "La Nueva Belleza (The New Beauty)". In 2007, American Idol contestant Chris Richardson performed "Geek in the Pink", which subsequently garnered the song mass recognition and increased downloads at the American iTunes Store. It was also performed later that year by Canadian Idol contestant Greg Neufeld. "Geek in the Pink" peaked at #22 on the U.S. iTunes Store on March 10, 2007, but it was ineligible for the site's Hot 100. The tape-recording of bootlegs during Mraz's shows is explicitly supported by him and his management. 2008-present:We Sing. We Dance. We Steal Things. Jason is currently promoting his latest studio album, We Sing. We Dance. We Steal Things. which was released on May 13, 2008. The first single "I'm Yours" reached #1 on AAA radio charts in the US. The single was a B-side to Mr A-Z, and was made famous by recordings from his live shows. In September 2008, the song became Mraz's first Top 10 hit on the Billboard Hot 100, peaking so far at #6. As of October 14, 2008, the album has been certified Gold by the RIAA, selling in excess of 500,000 copies in the US. Mraz performed "A Beautiful Mess" with a full orchestra at the Nobel Peace Prize Concert in Oslo, Norway on December 11, 2008. Recently, Mraz's song "Details in the Fabric" from his We Sing. We Dance. We Steal Things. CD was featured in an episode of Without a Trace. The instrumental beginning of "I'm Yours" was also featured in an AIG commercial. Also check his amazing live performance of "I m yours" at Korea. Mraz and his song "I'm Yours" was nominated for Song of the Year and Best Male Pop Vocal Performance at the 2009 51st Grammy Awards. The album We Sing. We Dance. We Steal Things. was also nominated for a Grammy Award for Best Engineered Album, Non-Classical in 2009. On January 31st, 2009, Mraz was the musical guest on Saturday Night Live, performing "I'm Yours" and "Lucky", the latter with Colbie Caillat. "Lucky" has peaked on the Hot 100 at 66. What to say about this guy!!! !.....In contemporaries he is most competent singer....checkout his live performance.